Garden Wooden Shed / Workshop'Jersey Apex' 7'x13' 12x120mm T&G shiplap. 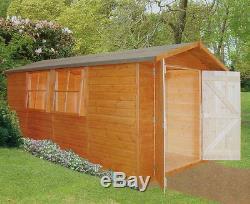 Jersey Apex' Garden shed / workshop 7' x 13' (1980x4030mm footprint size)!!! Big enough for those valuable tools or ride-on mower and other essential garden things. 2 fully opening criss-cross windows, and double door is strongly constructed with a full-lenght hidden hinge supplied as standard. External size: 1980 x 4030mm. Manufactured using 35 x 35mm wall framework, spaced at no more than 800mm (2'8''). Floor: 12x120mm T&G matching pattern boarding. Roof constructed using 11mm OSB. Minimum internal eaves height of 1760mm (6') - ridge height min. This particular item will be supplied in 12x120mm Tongue & Groove boarding pattern (as pictured), with 2 opening windows and double door. The door is fitted with T- hinges, and measure min. 1610mm (5'9'') high and 1360mm wide. Doors are ledged and braced with padbolt. 2 opening windows are properly morticed and tenoned profiled for weather resistance. 3mm horticultural glass is retained by profiled beading which is pre-mitred. The photograph shows 7'x13'. 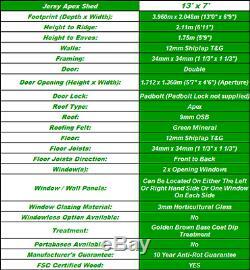 The item has 12x120mm T&G floor and walls, green mineral felt. Sale item will be supplied in a flat packs, with all fixings, green felt, facia bag and comprehensive installation instruction for a self assembly. The item will be supplied in a natural'honey-brown' colour only. Installation service available at an extra costs (usually, not more than 60% of the item price). Please note: on all our buildings we recommend a proper or concrete basement before installation. If you have any questions, please call on 07818608331/01553631839. Please note that we don't deliver to Scotland, Cornwall or Wales. Goods are subject to availability. In the event that we are unable to supply the goods, we will inform you of this as soon as possible. You confirm that the credit or debit card that is being used is yours. All credit/debit cardholders are subject to validation checks and authorisation by the card issuer. All prices include VAT (where applicable) at the applicable current rates. While we try and ensure that all prices on our website are accurate, errors may occur. If we discover an error in the price of goods you have ordered we will inform you as soon as possible and give you the option of reconfirming your order at the correct price or cancelling it. If we are unable to contact you we will treat the order as cancelled. On all our standard range or new orders, please allow upto 2 working weeks, from the day of placing an order and 4 weeks for all log cabins. One driver will deliver your chosen garden products to the nearest access point on your premises. Goods will be left at the most convenient place possible for you and the driver unloading them. If you would like your garden building erected, please notify us of any obstacles restricting access. Please Note: We will endeavor to deliver your building within 2 weeks from order. Tydd Bank Sutton Bridge Spalding, Lincs PE12 9XE Showroom Open Monday to Friday 9:00 - 4:30. Payments - Paying with us. The item "Garden Wooden Shed / Workshop'Jersey Apex' 7'x13' 12x120mm T&G shiplap" is in sale since Thursday, June 01, 2017. This item is in the category "Garden & Patio\Garden Structures & Shade\Garden Sheds". The seller is "norfolkshedsltd" and is located in kings lynn, Norfolk. This item can be shipped to United Kingdom.